Ice season is coming and while it is taking a little longer to get here than last year that gives you a little more time to get your kit together! Here’s some content I’ve previously posted to help you do just that! A little stoke video from my season last winter! Need to upgrade or round out your ice rack? Check out my Ice Screw Comparison article. Thinking about a new set of ice axes for steep ice? I’m excited for my second season on the Cassin X-Dreams that I reviewed here! Time for a new harness? Check out my review of the Petzl Sitta and the Petzl Hirundous! Need to update your “Ten Essentials”? You can see exactly what I carry here. 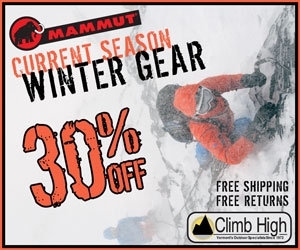 Need a new ice climbing pack? Check out the Hyperlite Mountain Gear 3400 Ice Pack here! New ice climbing boots? Have a look at the Acrux AR Mountaineering Boots here. Bookmark the Avalanche Bulletin and the Higher Summits Forecast so you know what the conditions might be like before you leave the car. Brush up your avalanche skills. Get your beacon out and practice with your partner! Haven’t taken an avalanche course yet? NOW is the time to sign up for one! Last chance to sign up for the annual Eastern Snow Avalanche Workshop (ESAW) happening this Saturday in Fryeburg, ME! You need to get fresh lithium batteries for your headlamp! I always have Energizer AA’s and AAA’s on hand. The best deal I can find on these batteries is on Amazon which is linked here. Maybe start using a Mini-Quad for your ice anchors? Watch an educational and motivational sick video! I’m predicting we hear about something being climbing this weekend… it will be barely climbable, but will signal the start of the ice season. For us mortals the ice will be reasonable in 2-3 weeks, plenty of time to have your kit together! Nice work Dave and a bonus kicker at the bottom! Oh man! Just got from Joe Dodge lodge… have all the toys! Can’t wait to get out there and do that!